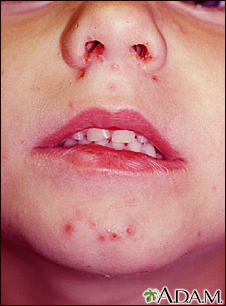 Impetigo is a highly contagious disease caused by streptococcus or staphylococcus bacteria. It causes a superficial skin infection which appears red with yellow or golden crusts. It is seen frequently in children on the face, upper trunk, and arms. Note that the nose is also infected.